The party is going strong, and Homestyle Gathering 11 is your one-stop home-keeping destination. Hey friends and party-people! Julie comin’ at ya! Homestyle Gathering 11 is ready for all bloggers to link-up and readers to peruse all the lovely posts going on in Blogland this week! Just a reminder… Homestyle Gathering opens every Tuesday at 6am PST (9am EST) and allows for new posts to be linked all the way through Saturday. 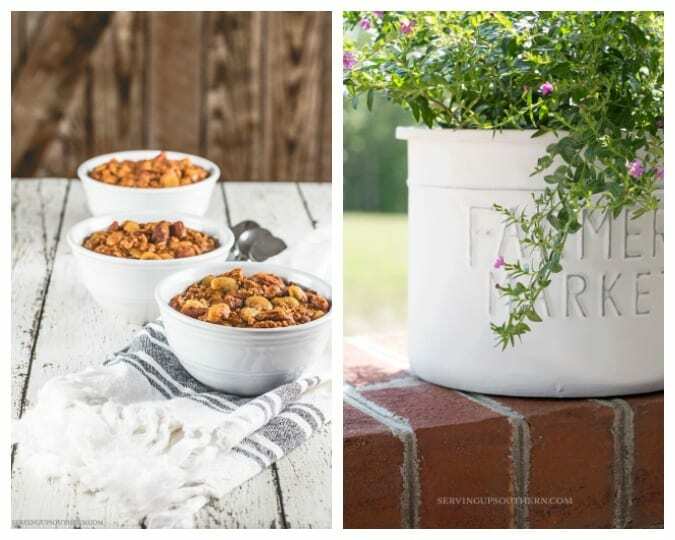 So bloggers, be sure to come and link-up new content throughout the week, and readers, be sure to come and check out all the new posts for decor, diy, recipes, and more! Just as a reminder, Homestyle Gathering is brought to you by Serving Up Southern and My Wee Abode (that’s me, of course!). Another reminder, we ask a guest blogger to host the party with us every 4th week! You never know…it could be YOU! And, of course, we select five features from the posts that are linked each week. Now, pour yourself your fave drinkie-poo, sit back, and enjoy all the home-keeping love that we have this go around! Holly from Home with Holliday is a queen of tablescapes. Really… she’s amazing. 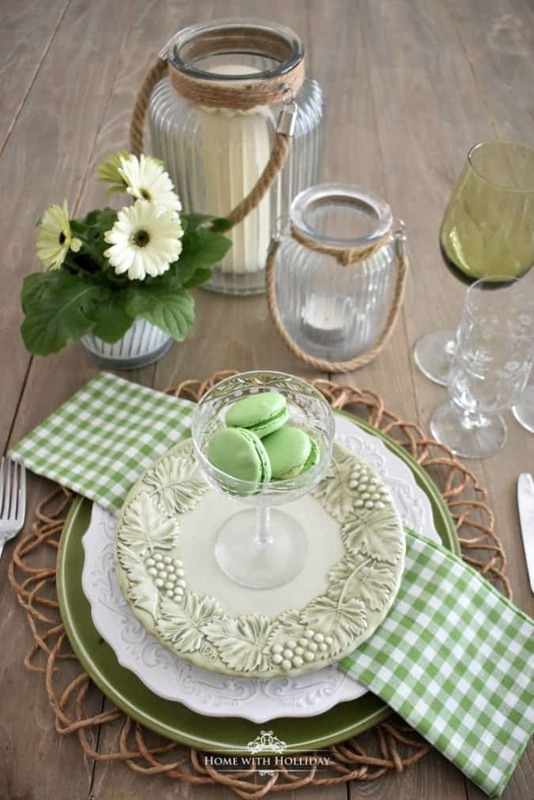 And this week she shared how to do a single, green place setting… FOUR ways! I especially love this inspiration because it’s perfect for small home living and elevates single-dining. 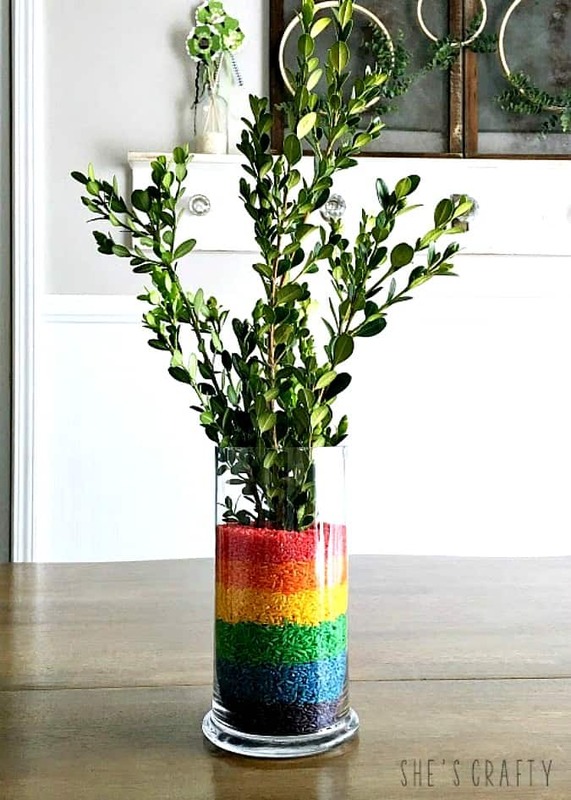 I LOVE inexpensive vase fillers, especially ones that your can change out with the seasons. Have you ever wondered how they color rice? 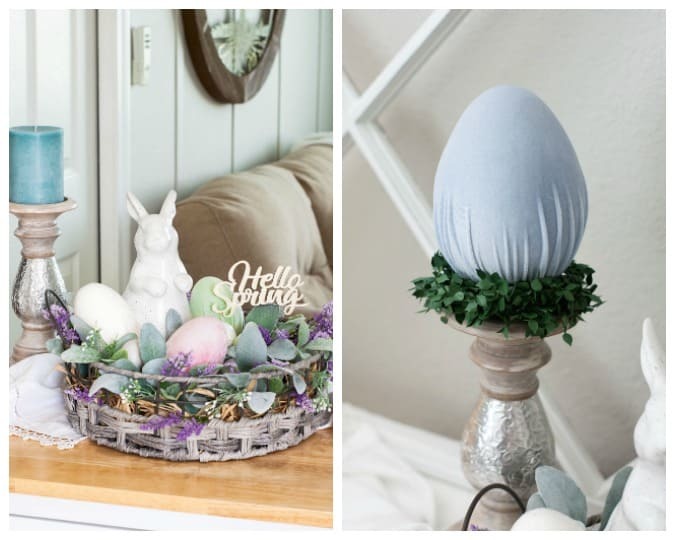 Well, Candice at She’s Crafty shows us how! Can you imagine this in orange/yellow/white for fall (candy corn! ), or any combination of colors to match your seasonal decor!!! Game-changer! Okay, so when my daughter and I saw this pic we were like, “Oh no!!! That’s going to melt in the yard! What are they thinking? !” And then we looked! 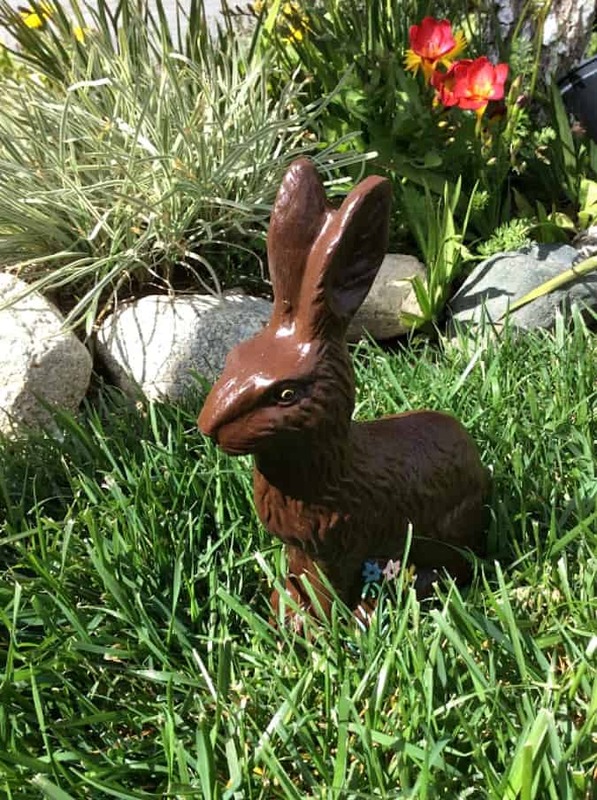 Lisa from Fresh Vintage by Lisa S shares how we can create a chocolate bunny that can “handle the heat”! 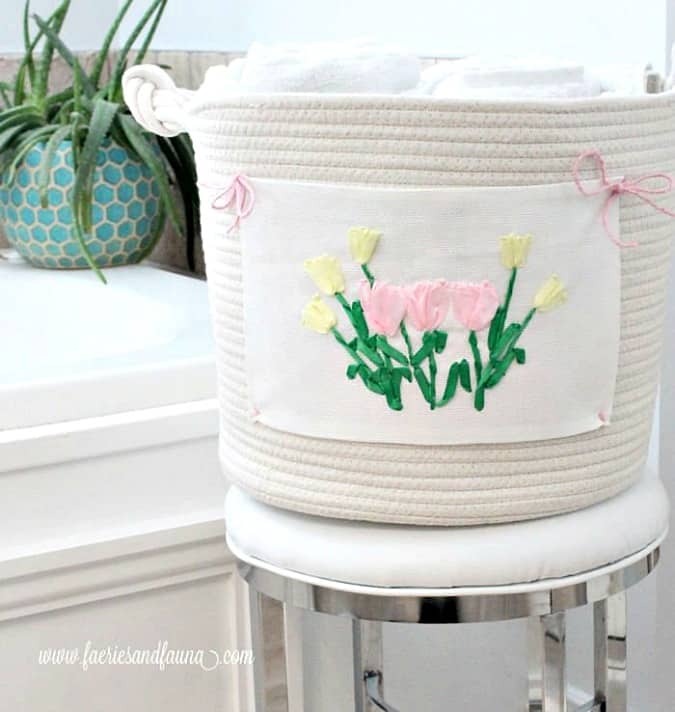 This sweet spring wall art is created easily with… Well, I’ll let Rachelle from My Hubbard Home share how to create this beautiful canvas. 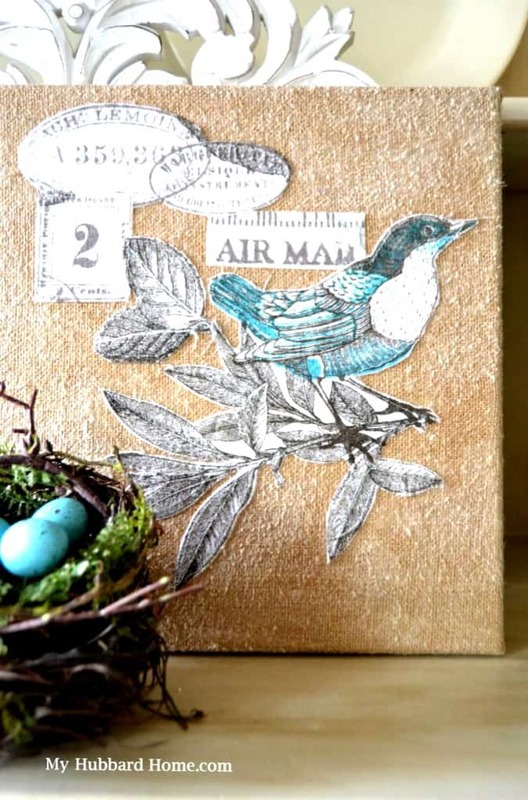 Don’t you just love the vintage bird and postal graphics? We have a ribbon embroidery tutorial from Leanna at Faeries and Fauna! What a lovely update to a beautiful basket! Interchangeable and fun! Hi Julie and Kim, thank you so much for the feature link up! And I hope you are feeling better, Julie. Thanks, Rachelle… I think I’m on my way to mending! Thanks for joining us, Marie! So happy you are here! Thanks for joining us, Cheryl! Hugs and hearts! What fun, I love a good party – thanks for hosting! So glad to have you, Debbie! Hoping we grow each week! Thank you for hosting. My goodness, it the 11th week already! I love all the wonderful ideas here! Hello, friends! I love all the features this week! I’ll have to look into coloring rice and how that chocolate bunny is surviving the heat! 🙂 I also love the green place setting. Have a wonderful week! I would love to color rice for seasons! Maybe a lavender, green and white for my spring look this year? Ooooo! Thanks so much for the link party! Have a great one! Hugs! So glad to have you, Benita! Hugs back! Beautiful features this week Julie! Thanks for hosting! Thanks for coming by! Love your wee chair! Now that’s Italiano! 😉 Thanks for linking-up! Hugs! Thank you so much for the feature! Much appreciated Julie. Thank you for hosting and allowing us to showcase our posts. So glad to have you link-up, Coco! Love your blog! Thanks for the party, Julie. Hope you’re feeling much better soon! Thank you, Bev… hope to be after finally getting a third diagnosis yesterday! Thanks for linking up! Thank you so much for hosting! I hope you are feeling better soon! I believe I finally was diagnosed correctly, after two wrong diagnoses! I definitely got worse before now just starting to get on the mend. Not fun when you are trying to work and blog! 😉 Hugs, dear friend! Thanks for inviting me to the party, Julie! Happy Spring! Thanks for hosting! Great party Julie, I especially love that white flower pot. Happy Spring friend. Yes, Leanna did a lovely job! Thanks for joining us, Sonya, dear! Thanks for hosting!! Glad to hear you are feeling better my friend! I actually had a huge relapse, and ended up at Urgent Care on Wednesday. Definitely got the right meds now! Whew! Agh!! 😊😊glad you are getting better!! 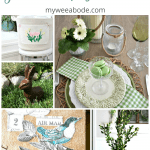 I squeaked in today with a post from my archives! Thanks for hosting!! Yay! So glad you linked up, Pam! Thanks for coming by, Christene! Hugs and hearts, friend!